Recently, I’ve noticed that there have been some shoe styles that have been dying out on Instagram. Yep, shoes that once were everywhere in my Instagram feed have slowly been fading away from fashion-girl wardrobes. So, what are these outdated shoe trends? I chatted with some of my fellow editors at the Who What Wear office, and we all agreed that once-popular shoe styles like PVC heels, sock boots, and platforms just aren’t dominating our Instagram feeds like they used to. What are the cool shoe styles that are everywhere on Instagram right now, then? Ahead, I’m highlighting the five most wanted shoe trends of the moment that we’ll be seeing long into 2019. Some are tried-and-tested shoes that have been in stylish women’s closets for years, while others are brand new on the fashion scene. Scroll on to see how fashion girls are wearing them and shop my edit of the best shoe buys to add to your closet. Pearl jewelry has been popping into my Instagram feed more and more, and similarly, pearl shoes have as well. Whether finishing a pair of heels or boots, this is the cool shoe trend I'm all about. Feathers were all over the S/S 19 runways, so I only expect to see more of this growing shoe trend. There has been no shortage of designer logos all over Instagram, but come 2019, the trend will only explode more. We're seeing styles like Dior's Oblique high-top sneakers from the debut collection of Mr. Kim Jones, as well as logo-stamped shoes from Fendi and Balenciaga—and we only expect to see more of the trend next year. 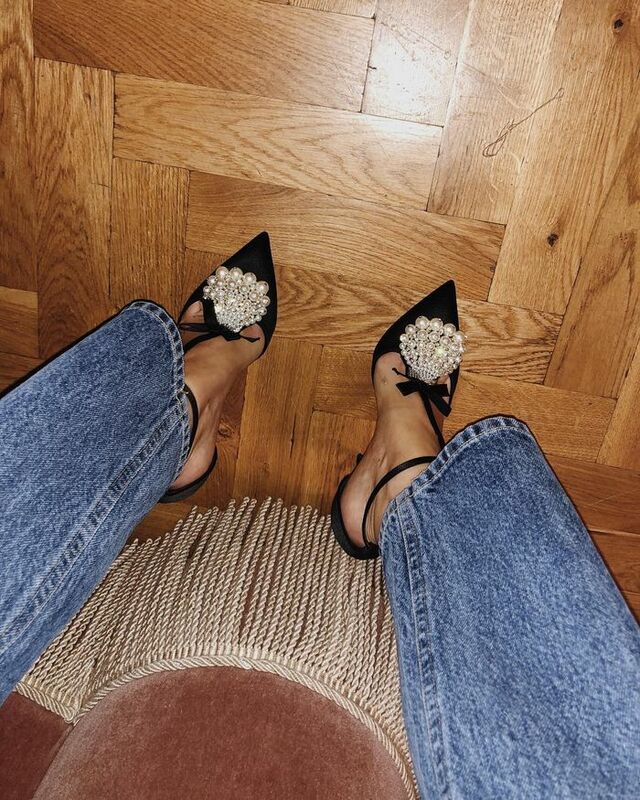 Crystal-adorned shoes are one of the most spotted footwear trends across Instagram. Make like Marie Antoinette and add some shiny satin shoes to your closet.